Your neighborhood is full of the most beautiful flowers. Great photos, thanks for sharing them in this very creative mosaic. What a lovely collage. 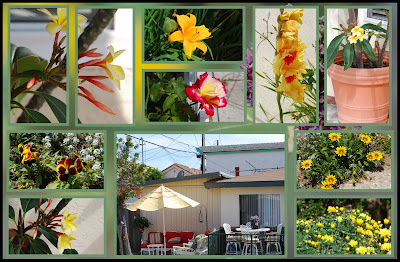 I especially like the yellow and red gladiolus. Really nice, especially when clicked large. Absolutely awesome photos. There is such beauty in the world if we just take the time to smell the roses. Wow, lovely flowers. wish i can do that also. Happy MYM. You do make such nice collages. Love the bright flowers in your mosaic, and your patio looks like just the right place to enjoy them. I love the way you do it all on a Monday. The glads are so pretty. That's nice. You have a lot of yellow in your neighborhood. Yellow is the color of summer, isn't it! All these yellows make for a nice time going for a walk! I always love your collages! Looks like a lovely neighborhood. Happy MYM! This is another great collage. The rose looks like it might be Double Delight, one of my favorites.